A fantastic thriller, this one really captures that one night in a single house of terror feel. This is a wild ride of a film. it’s the most stylized and intelligent look at simple suspense since hitchcock, with characters who are trapped inside their own home when burgulars come knocking. luckily this house is equiped with a Panic Room built for such an occasion and once our characters secure themselves inside that room, the real fun begins. the movie becomes a game of matching wits and trying to outsmart each other. while it does lose a little bit of it’s edge towards the end, it’s still a pretty triumphant and impressive film. I love it when directors try their hand at making a one-night, trapped in a building, murder-mystery. The idea to keep the characters stuck together in the worst of situations goes all the way back to movies like the exterminating angel and rashomon. still, those movies were experimental, and it wasn’t until the eighties that this type of film got brought to the mainstream. that’s when we got movies like die hard an clue. james mangold tried it more receently with his movie identity, and there was also that elevator movie, devil. 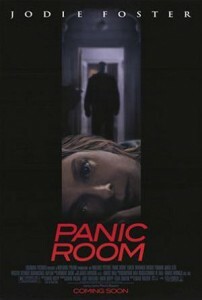 now david fincher tries it with Panic Room. the thing that’s so amazing and perhaps speaks to the sub-genre itself is that every one of these movies is quite good. 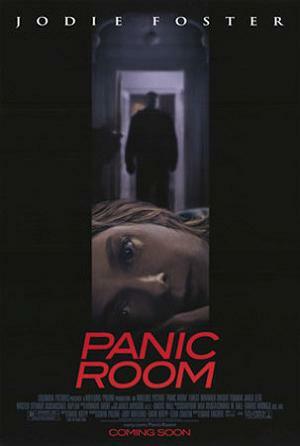 Panic Room is more of a thriller than a murder mystery. it’s not about the twist ending and who’s in on it, as much as it’s about being exactly what it appears, only much smarter and more suspenseful than could ever be imagined. the movie knows what its doing. it knows that to do this genre right you have to really make the layout of the house clear to the audience, and you also can’t waste a whole lot of time establishing characters in the beginning. the more you strip away and boil down to the basics, the better. this movie does all of that right. it starts out with a mother and daughter, (meg and sarah altman), looking at a brownstone on the upper west side of manhattan. they’re moving to a new home, and they take a tour of the place. you can’t ask for a better way of presenting the layout of a building to the audience than that. it even has clue beat in that department. this opening is also great, because not only does it cut right to the chase, and avoid wasting time, but it also begins with the house itself, treating the house as if it were a main character that needed to be introduced. soon we are with meg and sarah during their first night. they retire to their separate rooms after saying goodnight, and that’s when the burgulars show up. the movie handles the introduction of these characters flawlessly, keeping us inside the house as those men are outside. we never go out with them, but instead only see their reflections and silhouettes through the foggy windows. it’s raining outside and the sounds of the rain echo throughout the house as the camera moves all around it, following the burgulars from one part of the outside to the other. it’s very hitchcockian the way the camera faces the front windows when the burgulars are out there and then moves through the house to show us them out in the backyard through the back windows of the house. this definitely feels like dial m for murder or psycho, with the director keeping things from the audience and order to build up suspense. after we follow these guys around the outside, they do figure out a way to get in. this is when we really get a look at them for the first time, only one of them is wearing a ski mask which covers his entire face. you can bet this guy is the scary one, talking in a low, muffled, and expressionless tone with limited word choices. this is the guy who has a gun and shows us early on that he’s all business. he’s raoul, played by dwight yoakam. the other two burgulars are played by jared leto (now an oscar winner for dallas buyer’s club), and forest whitaker (now an oscar winner for last king of scotland.) both of those films came way after this movie. the three men try to keep quiet in the house, but realize pretty quickly that there are people living here and how much it is going to throw off their plan. this isn’t just a random break in and robbery. turns out there’s a whole backstory to the connection these men have with the house. they know about where a large sum of money has been hidden. on top of that, they know all the secrets of the Panic Room. one of these men, burnham (whitaker), is the guy who designs these Panic Rooms and even built this very one. the problem is, knowing all the tricks or not, there is no way into the Panic Room once the door is locked. it’s a tiny room, about the size of a large walk in closet, and meg and sarah run inside there as soon as they catch on that there are burgulars in the house. they have cameras inside the room which allow them to watch the men in their house, and there’s even a p.a. system that allows them to make announcements through speakers. the burgulars can’t communicate back as easily and so they are forced to write signs and hold them up to the cameras. this proves to be a very suspenseful method when it comes time to find out what the burgulars want. meg tells the men through the p.a. system that they should take whatever they want and then leave. that’s when they hold up a sign that says what they want is in the Panic Room. suddenly this story becomes a whole lot more elaborate. it’s now about the burgulars trying to force the mother and daughter out of the room while meg tries to find a way of getting help. there are all kinds of cool ideas that come up, including using a pipe that leads outside to signal s.o.s. with a flashlight, and sending gas into the Panic Room in order to flush the characters out. this is an intense cat and mouse movie loaded up with ideas. it is smart in the ways that it keeps things constant for a while and then saves the changes for the second half of the movie. two example of that include raoul eventually taking off his mask and meg eventually coming out of the room to match wits against the burgulars from the other side of the door. unfortunately the movie does begin to drag a bit toward its ending. once the villains become vulnerable, the suspense starts to deflate pretty quickly. that’s the movies only mistake. 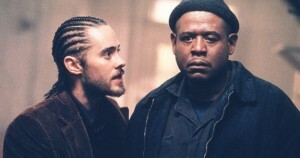 for the most part, Panic Room is a pretty excellent film. it definitely plays things smart, choosing style and suspense over cheap twists the way so many movies of today resort to. this film instead uses it’s location as a primary player and really never leaves the house. consider that the opening scene involves the characters taking a tour of the place, giving the audience a sense of the layout. there are some fantastic moments here, like when director david fincher channels brian depalma and allows us to see through walls in order to show characters on both sides of something. there’s that great elevator moment, for example, where we see the burgulars waiting outside the elevator door ready to bust in, while we also get to see the characters inside of the elevator, all in the same shot. this is impressive stuff. fincher clearly knows what he’s doing, giving us the rainy night outside and allowing us to feel like we are right there in the house with these characters. it’s a pretty excellent film.